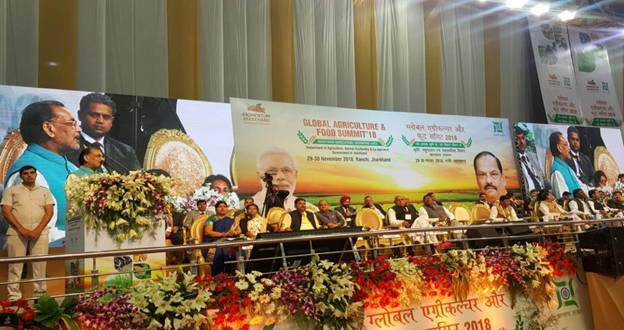 New Delhi: Addressing the inaugural session of two day Global Agriculture & Food Summit-2018 on 29th November at Ranchi, Union Agriculture and Farmers Welfare Minister Radha Mohan Singh said that the unprecedented progress has been made in the agriculture sector with the efforts of the government. The foodgrain production in 2017-18 (4th Advance Estimate) stood at 284.83 million tonnes as compared to 255.59 million tons average production in 2010-14. The production of pulses also rose by 40% from 18.01 million tons in 2010-14 to 25.23 million tons (4th Advance Estimate) in 2017-18. Production of horticulture crops recorded 15.79% growth, fisheries production under Blue Revolution 26.86% and animal husbandry & milk production 23.80%. He also informed that to promote organic farming, Paramparagat Krishi Vikas Yojana (PKVY) was initiated in 2014-15 and for north east, Mission Organic Value Chain Development for North Eastern Region (MOVCD-NER) was started. National Agriculture Market (eNAM), a new market mechanism has been started in order to ensure remunerative price for the farmers’ produce while advancing towards ‘one nation one market’. Till March 2018, the target of integrating 585 mandis with e-NAM has been achieved. In order to reduce the cost of production, Soil Health Card and use of neem-coated urea and schemes related to ‘per drop more crop’ are being targeted and implemented. Besides this, the Pradhan Mantri Fasal Bima Yojana (PMFBY) was initiated from Kharif 2016 to overcome the risks related to agriculture against disasters. This scheme covers all food grains, oilseeds and commercial/ horticultural crops. All risks – prior to the crop sowing, during the harvest and after harvest – are included in the scheme. Singh stated that the government is also promoting quality in agriculture through food processing. Pradhan Mantri Kisan SAMPADA Yojana has been started with an allocation of Rs 6,000 crore. The forward and backward linkage of agro processing clusters is being developed in order to enhance food processing capabilities. Close to 20 lakh farmers are being benefitted while also creating employment opportunities for about 5.5 lakh people. Besides, Minister further said that the government has taken a historic decision towards fulfilling the promise made to farmers by increasing MSP by 1.5 times or more of production cost for all notified crops from Kharif 2018-19.